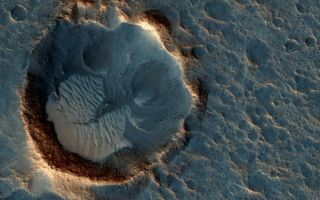 In Spring 2015, images of the Acidalia Planitia region of Mars captured by the HiRISe camera, giving writers of "The Martian" fodder for their big screen adventure to the Red Planet. Acidalia Planitia, a region on Mars imaged by the High Resolution Imaging Science Experiment (HiRISE) Camera on NASA's Reconnaissance Orbiter, is known to the public for reasons less than scientific. While the real region has been a location of interest as part of an objective to locate safe landing sites for future Mars missions, many may know of this site as it relates to the popular movie "The Martian:" this is the area where Ares 3 and its crew lands.